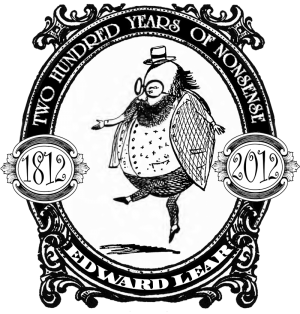 Edward Lear: Two Hundred Years of Nonsense! But a few think him pleasant enough." If you're not a fan of Edward Lear ... you will be! And if you're not a fan of nonsense ... well, we just feel sorry for you. Here you will find links galore--to just about ALL of Edward Lear's impressive output of nonsense limericks, stories, poetry, alphabets, beastiaries and botanies. As well as some of his more serious artwork. We're adding to the mix all the time, so check back often! If you're a Twitterer and you feel like there's currently not ENOUGH nonsense on Twitter, follow us @Lear200, where we will be posting a LOTD--your Lear Of The Day! If FaceBook is more your speed, you can goof off from your job even more (Shhh! We won't tell!) on our FaceBook page. So what are you waiting for? Start exploring the world of Edward Lear--and celebrate this true genius of nonsense!